We have certainly had a busy November. For the first time in Rebrickable's 3 year history, I have had another developer help me with code changes. As a control freak, this was pretty nerve wracking at first. However, unlike myself, Jantjeuh is a professional web developer who has also been a Rebrickable Inventory Admin for the last 4 months and at the start of November started helping me fix my dodgy code. Surprisingly he didn't run away screaming after seeing it :) He has been invaluable in refactoring a lot of code to make it easier to maintain and helping me switch to better web development workflows like using git. Thanks Jantjeuh! Of course, as well as code changes there have been plenty of data changes by the team of Inventory Admins and Set/Part Managers keeping the database up to date. 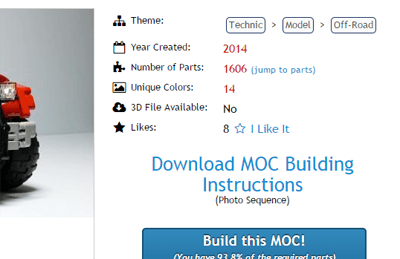 You can now give feedback to MOC designers in the form of a simple Like. At the moment you will find this link just above the download link or in the MOCs footer with the view counter. When you click I Like It you will be prompted to provide an optional comment which is encouraged. However, please try to give meaningful feedback and not simple "Thanks!" messages :) If you do not wish to leave a comment, that's fine to and your Like will still count. Now when you click on a part or visit a part's details page, you will see a lot more useful information. Notably, it will list each color and how many of each color you own. Hover over the color squares to see the exact color in case it's not obvious. 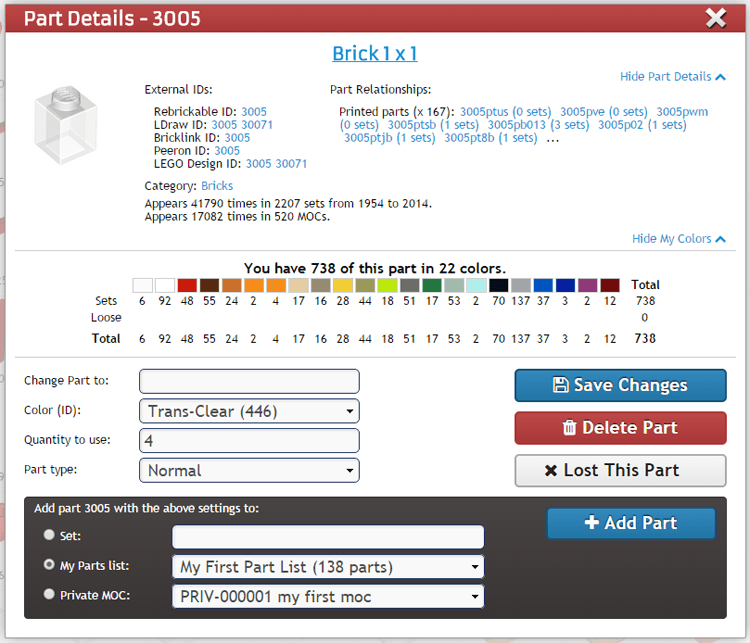 MOC Designer - now highlights extra parts when submitting alternate builds so you know at a glance if it is a valid alternate build. Changed part's sets ordering by color hue. Comments now allow unlimited nested comments via scrolling. Comment context likes go direct to individual comments. Renamed some menu items (My Private MOCs, etc), and moved the stats links to the footer. Fixed commenting from an ipv6 IP! There were a couple of frustrating issues with Bricksafe this month as detailed on the outages page. I ended up building a completely new server with all the latest software versions as well as taking advantage of recent AWS hardware offerings (eg SSD disks). I don't see the Like thing on the MOC pages. Is there something I'm missing? I am logged in and everything. Hmm, it's really not there. I'm emailing you (support) a screenshot. OK, now I see them on the MOC page with the help of support. :-) I was looking on the "build this MOC" page and the Like Star isn't there yet, but will be. I'm loving the new features in the parts information page. Keep up the great work! I have an idea for sets to consider when you're missing parts to build something : put an option for sets available today, like sets from the last 2 years tops. Is it difficult to implement ? -Set collector ADI role: that you have a huge collection of sets (why not?). -Top sets and themes: an special page for the most popular sets (like the Unimog) and themes. About the delete part function - you wrote it works the same as setting to 0 and saving. Does it mean it ignores the "Quantity to use" number and deletes everything from the part list used in a selected colour? 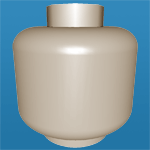 You could also understand that it would delete selected number of pieces from your inventory. The 'Delete Part' button does exactly what it advertises: it deletes the part from the current inventory (i.e., sets its quantity to 0). The 'Quantity to use' number is indeed ignored. are you going to open source the code on github? i think more people would contribute! For now it's private, but who knows in the future. +1 here. I'd definitely help. THANK YOU FOR A LOT!